for all you lovers, just in time for valentines day. The Pop Heart Pattern I've been talking of for so long. Hope you like it, it's free as well! 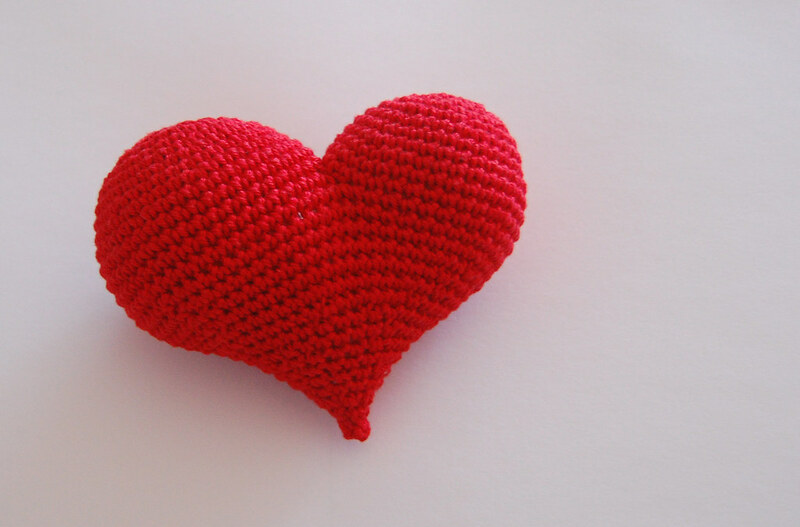 crochet your darling a popping heart! or use the pic as your desktop wallpaper to celebrate this special day! I think this is adorable! My kids are cheering because I just printed off the pattern so I can make them one. My oldest is yelling MOMMY! I WANT THE GREEN ONE! I had to tell him I don't have that shade of green right now but I'll pick him a different color. That's settled him down for now ;D Thanks for sharing something so cute! The shape is perfect! those hearts are great! thanks for sharing! Those are too cool. Thanks for sharing the pattern with us. Great work! I would like to know if I can post the pattern on my blog in Taiwan and use your original link. Please let me know, Thx! Will be sending this to my mom for a birthday gift, too. Hello, i love the pop heart so much but still can't view the pattern, i also like the flower pot and fish, would u please send the three of them at straw_berry_80@hotmail.com,thank u.
I thought your picture of the four different colored hearts was so cute, I "stole" the picture to use as my computer wallpaper (I promise I won't use it for anything else). 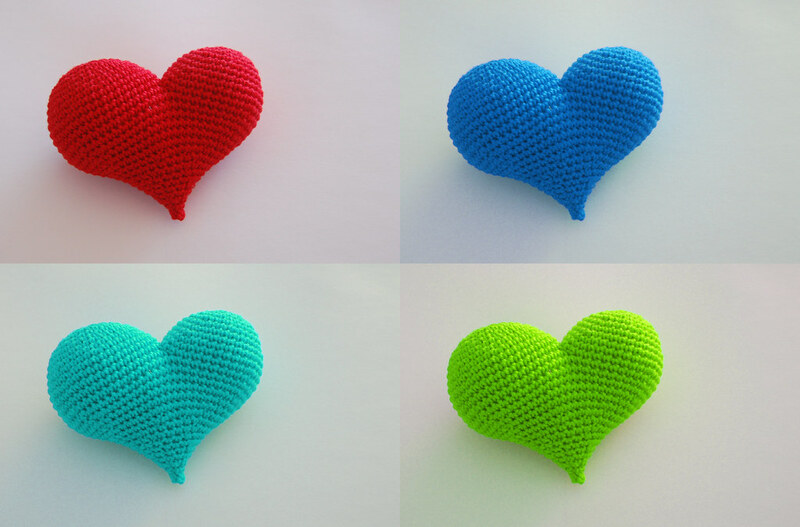 I love being able to look at crocheted heart puffs in such vibrant colors. Almost makes it worth being at work (I said almost :). Those hearts are soooo incredibly sweet. I'm trying to make one now. I got to the point of connecting the two cups and I cannot understand how to do this. Could you please explain "for SUPER dummies" how to put them together. Could you please do that via email at elenamch@gmail.com. THANK YOU! Thank you so much for the free Pop Heart pattern. I made a red one for valentine's day for my husband of 20 years and I added a key dangling from the bottom with a note that said "You have the key to my heart." Also a suggestion: I stuffed mine with leftover yarn pieces I had been collecting from previous projects and it worked so well that I am now stuffing another one with some dark acrylic yarn I purchased at a garage sale for 25 cents. Thank you for such a lovely pattern. Your work is marvellous! Love this Pop Heart. I will be linking up at www.tangledhappy.blogspot.com next week. Thanks for sharing this! Thank you so much for sharing your fantastic pattern! It's super cute, and I can't wait to get one on the hook :) Now I just have to choose some yarn... I love the green one! I really love that heart! lol, heart that heart, but I am going to try to follow that pattern, can't wait! Going to give it to a friend as a keychain. thanks a million, I knit it just right now! I've checked the links, they should work now. I just love this heart! I was wondering if you would be okay with me using the picture for a Free Valentine’s Round Up I want to do to link to this pattern? Hey could you tell me what the mesurement is of this popping heart. It's really nice :-) length and hight if that's possible. sorry i'm french so can you just explain what it means when you write "(SC2,M2) x6" does it means that i had to increase with two single crochet stitches and repeat it 6 times ? so if a understand for this instruction "sc1, (m2, sc3) x5, m2, sc2" i had to make one single crochet stitch, then 3 single crochets stitches 5 times ans then 2 crochet stitches ?